There is no actual treatment for an abscess once the white line has been invaded. The condition has to run its course. Epsom salt or vinegar soaks may help soften the coronet band, while pain meds and padded boots can offer relief post rupture. Digging openings into the sole or white line is a common approach to relieve pressure. However, by the time the horse displays pain, the abscess is close to rupturing at the hairline. 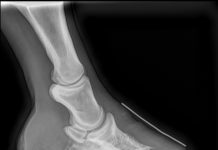 Therefore, that procedure most often only causes further trauma to a hoof, rather than relieving pain. Poultices sometimes may help drain a bar abscess if caught soon enough, but the pain and rupture will still take place. Skilled veterinarians have been known to drill tiny holes in the outer wall in the path of the abscess causing discharge and instantaneous relief from pressure and pain. Done correctly, this is one of the only methods that can provide instant and actual relief to a horse suffering from a wall abscess. However, this method isn’t practical for an abscess of the bar. Also, many veterinarians aren’t aware that the abscess doesn’t trek straight up the wall, but treks at the same angle of the angle of the growth of the horn tubules. Numerous holes drilled into the hoof wall in an attempt to find the abscess track could cause secondary problems. Anytime I have introduced this technique at conferences, the first question is always, “How do you know when to stop drilling?” The answer: When you hit pus. The important bit is to follow the angle of the horn tubules from the entrance site and you’ll find the abscess channel. For horses that have been processing white line abscess chronically for some time, expect it to take several hoof growth cycles before the horse stops processing abscesses or at least less often. Rehabbing an abscessing hoof requires trimming at 4 week intervals. 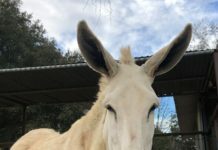 It can take many months, or years to grow out new hoof material to replace the involved connective tissue. For the sake of your horse, please be patient with the rehab process. It will take as much or more time for your horse to make his way out of this condition as it took to get into it. Preventing abscesses of the white line is as simple as making sure that your horse’s hooves receive correct trimming at regular and frequent intervals, removing and controlling flare. For optimum hooves, trim scheduling should be at 4 to 6 intervals. 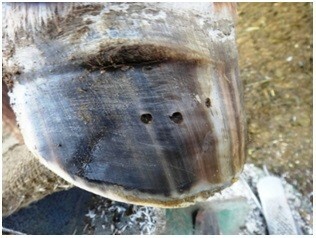 Trimming strategies should produce healthy hoof horn (no flare) and well maintained bars with tight, connecting tissue (lamina/white line). This strategy will reduce and eliminate abscesses. Radiology and even MRI usually will not pick up the abscess track. This lack of obvious cause of the observable lameness often leads to a search for alternative causes. The use of this technology can show us different hoof anomalies that otherwise would never be discovered, that have always been a part of the hoof internal structures, and have no relevance to the horses current discomfort, but will receive the blame. The above isn’t always the case, but it is not an uncommon scenario that leads to mistreatment, usually an unorthodox shoeing strategy, which may not produce an obvious, permanent and/or “immediate” cure. So the only consideration for the horse at some point is to euthanize. Thermal Imaging does at times illuminate abscess inflammation. Founder can result in more than one hoof caused by the severe inflammation in the abscessing hoof or hooves. It’s not unusual for a horse to be diagnosed with founder, but the initial cause (abscess) may never be detected. That’s when horses who have never had an issue with “grass” are often pulled of pasture indefinitely, but needlessly. 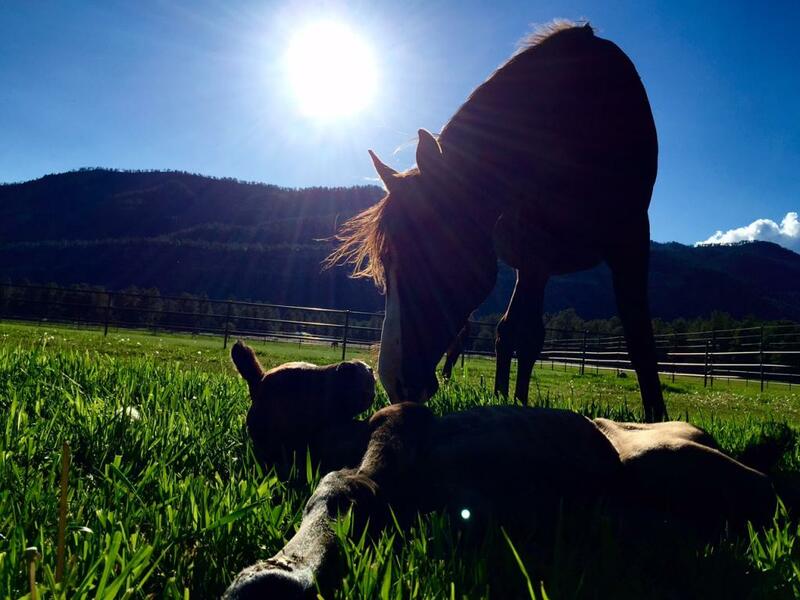 Once a horse has been pronounced with the “f” word – founder. It’s thought that the cure is troublesome and expensive, or worse, there is no hope at all. That simply isn’t true in most cases. Founder can result in more than one hoof caused by the severe inflammation in the abscessing hoof or hooves. The cause of the founder is mechanical in this case and not organic. In severe cases a hoof can be fully engulfed in several abscesses at one time causing severe pain and lameness and founder. 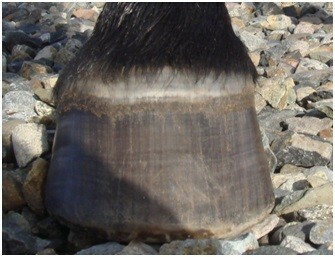 If left untreated (untrimmed) the hoof may eventually lose most of its attachment material. Shoes can stall out the process of abscess and should be pulled during rehab. Lameness in a shod hoof is frequently caused by abscesses located at the junction of the bar/heel (seat of the corn) which can be difficult to locate until the hoof has been indefinitely unshod and trimmed correctly and regularly. Abscess discomfort may not cause a horse to display obvious lameness all the time or at all. Lameness may be off and on. Not appearing at the walk, but obvious at the trot or canter. 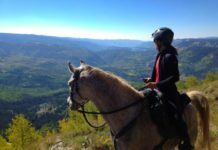 A horse may seem fine until the weight of the saddle/rider is added. Even if we can drain an abscess, it will still rupture at the hairline in most cases. One hoof growth cycle (HGC) takes about one year so patience is required. The horse will improve with frequent corrective trimming. 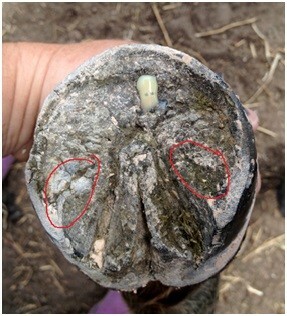 Creating craters in an abscessing hoof will only add further healing time and will allow pebbles and debris to invade the hoof that wouldn’t otherwise be an issue. This procedure creates a secondary problem in the hoof. Because no obvious signs of pain can be detected initially when a hoof is processing an abscess, very often riders will comment that their horse is lazy because their horse is fine in the pasture, but has learned that if he starts to limp when being ridden he will get out of work. First, that is ridiculous. Second, that is exactly how abscess pain is often presented. Off and on. The better we understand the cause, prevention and cure of hoof abscesses, the more years of soundness our equines will experience. Thank you for taking the time to read and understand this important information about a very common, yet commonly misinterpreted hoof ailment. Editors Note: You can read Part One of Patricia's blog here. Previous articleThe EasyCare Therapy Click System, The Easyboot Cloud and The Easyboot Zip!